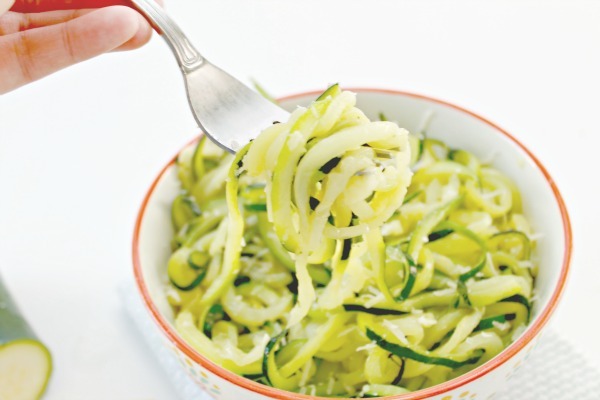 These zucchini noodles, also known as zoodles are delicious, healthy and super easy to make! I am definitely finding myself in cooking mode over here, like last night when I made Cilantro Lime Rice for the first time. I’m ready to switch things up and try some new recipes to add in with our normal ones. One of the things I really struggle with is finding vegetables to serve with our meals that the kids will actually eat. They would live off of my No Boil Baked Mac and Cheese if I’d let them, but come on now. Sometimes you need to eat something green. I have to tell you…I was a little skeptical of the new vegetable noodle craze, but dang! 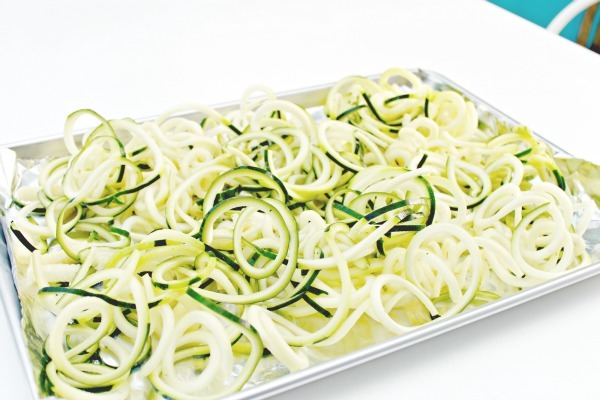 These zucchini noodles or zoodles as some call them are actually delicious! I’ve seen them served raw with some dressing, but I wanted to try them cooked. They turned out amazing and both Kate and Matt loved them! Cam was out on these…he’s 17 and wouldn’t even try them though. They are so easy to make, and hopefully they will give you an additional healthy option to serve to your family too! They are a terrific alternative to pasta too! This post contains affiliate links, which means if you purchase a product via these links, I will receive a small commission. 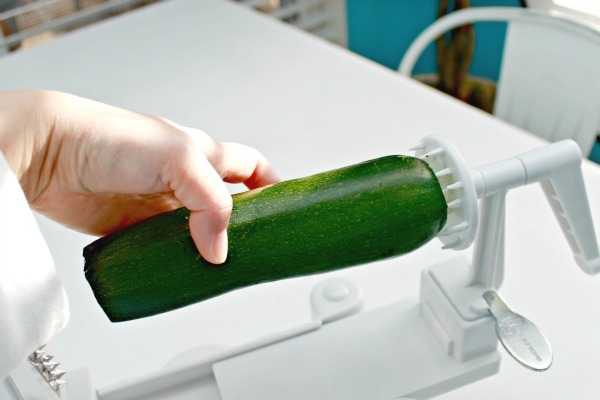 You simply cut the ends off of your zucchini and place one end on the vegetalbe holder. Just push it into the spikes. Next, Start twisting the handle while gently pushing forward. I like to use my other hand to hold the top of the left side down for stability. 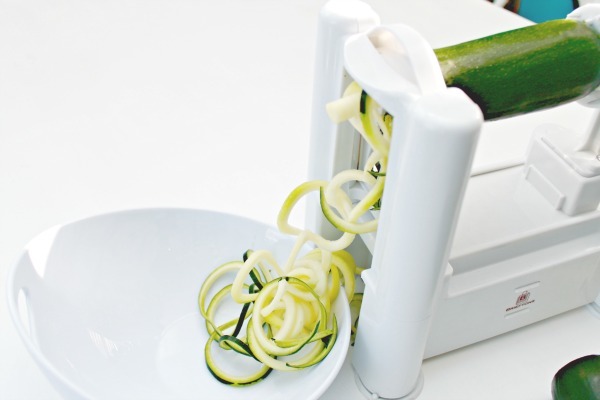 There are little suction cups on the bottom that keep your spiralizer from moving around. I sit a bowl on the other side to catch the zucchini noodles. 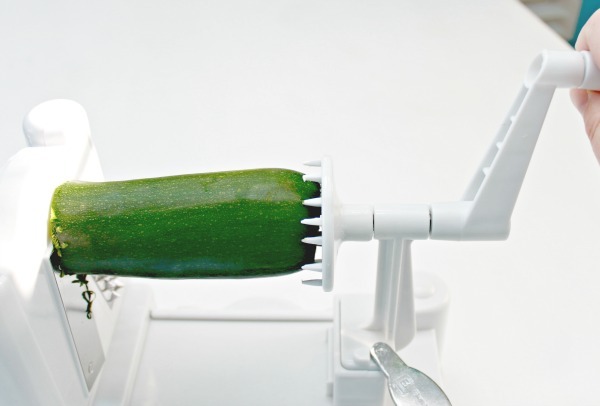 This is 3 zucchini that have been spiralized. I place them on a foil lined cookie sheet and spread them out. Drizzle them with olive oil and sprinkle a little bit of salt across the tops and stir them around to distribute the oil. I like to place mine under the broiler in my oven at 500 degrees on the middle rack of my oven. For me, they take about 10-15 minutes to cook, and I use some tongs to move them around a couple of times while cooking. Just keep an eye on them so they don’t burn. I served mine in bowls with some parmesan grated over the top and a little cracked black pepper. They were so tasty that no sauce was needed….they were delicious! I can’t wait to make them again, and maybe add a little parmesan cream sauce and chicken to them…that could be a whole meal on its own! You can also try my Parmesan Spaghetti Squash…so yummy! 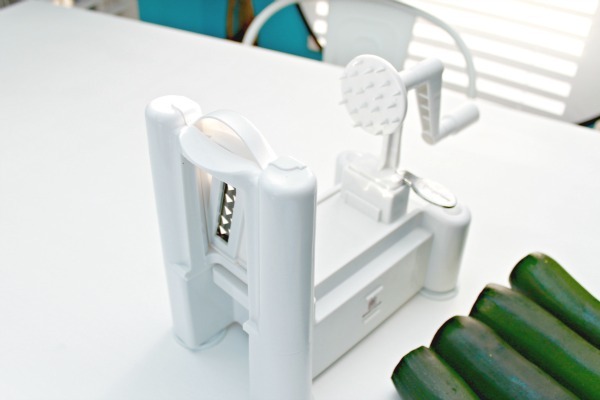 If you are looking for a vegetable spiralizer, you can check out the Briefton Spiralizer HERE to hand spiralize and this KitchenAid Spiralizer Attachment HERE if you have a KitchenAid Mixer. 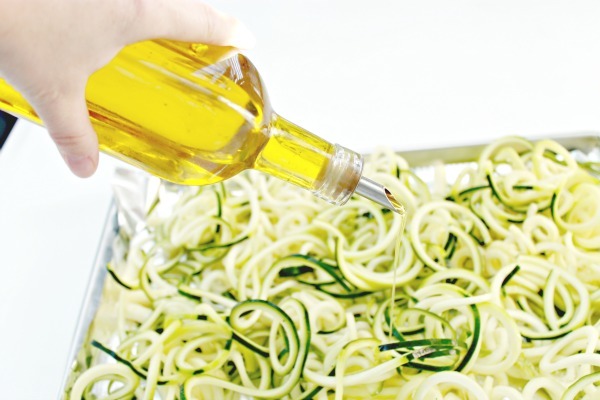 Looking for different ways you can use zoodles in some amazing recipes? 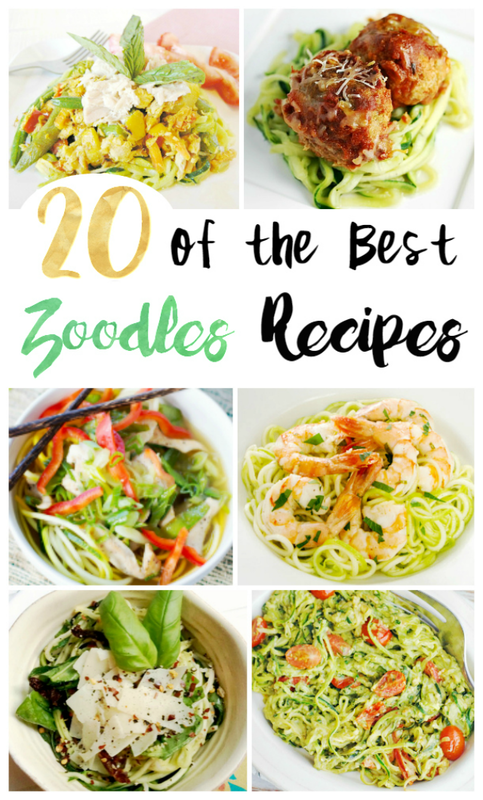 You can find 20 Delicious Zoodle Recipes HERE! If you have any zoodle recipes or other spiralized recipes that you’d like to share, be sure to post them to my Mom 4 Real Facebook Community Page HERE! I love to chat, answer questions and share tons of ideas over there! I am wanting to try these, but I am a texture type person, I know its weird, I tried spaghetti squash, but the “noodles” were to crunchy for me, so my question is, are these still crunchy or are they soft like a noodle or are they still crunchy like a raw veggie? Or have you or any of your followers tried boiling them? Inquisitive minds want to know! I love all things pasta and have been trying to clean up my eating habits. I too am a texture person (weirdos unite! lol) and found these to be too crunchy and not textured like pasta at all. However, I never really liked squash to begin with so I may not be the best person to comment. I have boiled them, they come out very soft. I want to try it in the oven. Thank you Jessica! I love to eat these raw with salt. Never tried to cook them. Ha! I’ll have to try it. I also spiralize baking potatoes and yellow squash and eat them raw. I would like to try to freeze some zoodles for winter months. Any suggestions so the don’t turn out soggy? I just tried making them and they were delicious! I wasn’t expecting that all. Even my boyfriend who hates zucchini enjoyed it! Thanks for sharing this with us! Thanks for this basic zoodle,recipe. I am a newby to zoodling and have searched high and low, for a “first” attempt recipe! This is perfect!